The Question -- Who is a “photographer” in today’s connected world? The Answer -- EVERYBODY WITH A POINT AND SHOOT, CAMCORDER, SMART OR DUMB CELLPHONE, OR PHOTO-PAD! 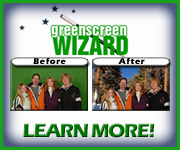 GREEN SCREEN - ALL ABOUT IT!! Steady Snake Tripod! to hold your IPad! Copyright(c) 2006-2013 NetSurferNews. All rights reserved.